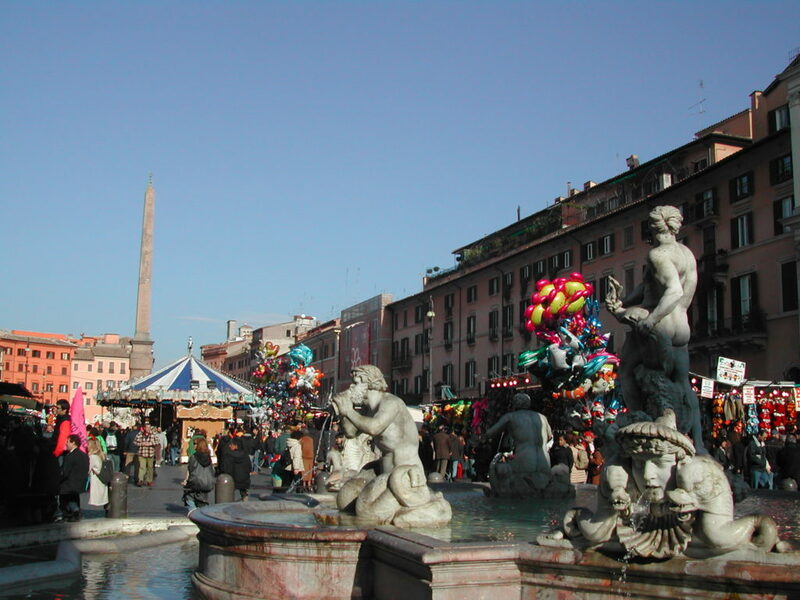 Throughout the whole of December, you will be greeted to a hub of activity and a whole host of sights and smells, as the log cabins and wood huts of the annual Christmas markets go up in the square of Piazza Navona. During the day, you can expect arts and crafts stalls selling everything from fine jewellery to wooden toy soldiers and tree decorations. Or you can head to one of the many food vendors, with elaborately decorated gingerbread houses, mulled wine or traditional panettone. When the sun goes down though, this little square comes alive, with street performers such as circus entertainers and jugglers, as well as musicians and artists, so grab a bag of roasted chestnuts and enjoy the show. The 8th December is of great religious significance to the Catholic community in Rome, as it is the celebratory day dedicated to the Blessed Virgin Mary. While the Pope looks on to keep things in check, people hold a huge feast in Piazza di Spagna. If you’re planning on staying in Rome in early December, this is one not to miss, with plenty of dancing, laughing and festive merriment to go around. You can also watch as the local fire brigade run a ladder up the central statue of the Madonna, and place a wreath over her outstretched arm. If you want to enjoy the music scene while you’re in Rome, then you’re in luck, as the Special Christmas Concert takes place on 21st December this year. In a unique combination of vocal, instrumental and visual art, the magnificent Baroque church of St Agnes in Agony (Sant’Agnese in Agone) in the Piazza Navona, will be transformed in one incredible evening. A special collection of works will be chosen by the Baroque masters of the Sistine Chapel, so this really is a once in a lifetime experience. There are still some tickets available, so you’d better book them before they sell out via Rome Opera Tickets for the best deal. The biggest and most popular event of the season has to be the free concert and fireworks display that’s held in piazza del Popolo for New Year’s Eve. People travel there in their hundreds, tourists and locals alike, for a spectacular show like you’ll never see anywhere else. If you see people throwing appliances off their balconies too, don’t panic; this is a tradition valued by older Roman generations, where they rid themselves of unwanted durable products for a fresh start. Where are you heading this winter?